Jamaica, $10, 1990. Arrival of Columbus in the New World. Look at all those different faces. My theory is that somebody was travelling round the world, impersonating Columbus. People hadn't heard of false news in those days, and the camera still hadn't been invented. From Jamaica in 1975, a $10 silver coin and a $100 gold coin. Because the gold coin was smaller, they used the same portrait as on the $10 coin but removed the ship. Unusual approach. Do you have any thoughts about that? 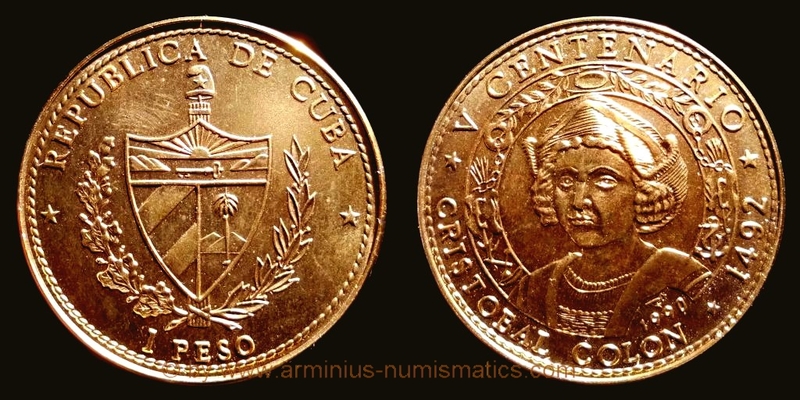 Cuba, 1990 AD., 5th centenary Discovery of America - Cristopher Columbus commemorative, Havanna mint, 1 Peso, KM 308.
gold-plated copper-nickel, a private electroplating trial ?